Give gratitude and thanks to the teacher in your life or your child’s life with a gift that acknowledges their hard work and dedication. A beautiful floral arrangement could be the perfect gift to brighten their day, and below are some of our Teacher Appreciation Gift Ideas that will make them smile with appreciation and happiness. This beautiful bouquet will be sure to bring sunshine and happiness to your special recipient’s life. Bright orange gerbera daisies, orange Alstroemeria, hot pink mini poms, and yellow cushion poms are hand-arranged in a beaded green vase and is the perfect way to express your gratitude. Send a stunning floral arrangement to the special teacher in your life as a token of your appreciation. This bouquet features hot pink roses, yellow Asiatic lilies, white daisies, and green button poms that are hand-arranged in a glass vase with a decorative colorful bow. Available for same-day delivery, with a personalized card message, this makes for a truly wonderful gift. Send a message of your sincere gratitude with this gorgeous basket of colorful spring flowers featuring bold purple iris, statice, cheery yellow Asiatic lilies, soft yellow carnations, and bright yellow daisy poms. This floral arrangement, which is delivered in a bamboo handled basket, is a wonderful display of springtime charm and is sure to express your warmest wishes to your special recipient. 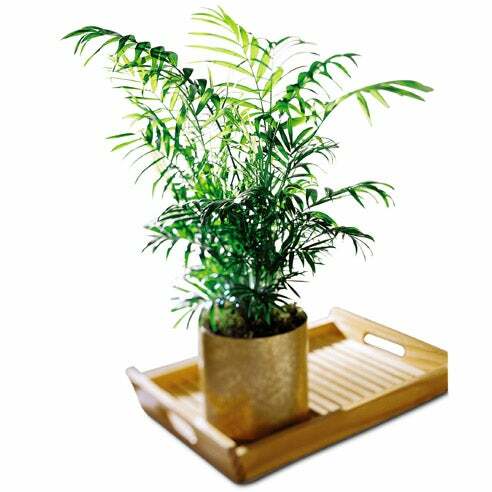 This simple, yet beautiful palm plant will be sure to add exotic elegance to any home or office and is delivered in a keepsake planter. Measuring approximately 26H x 12W, this lovely arrangement is available for same-day delivery and offers peace and serenity. Convey your message of sincere thanks with a “fresh from the garden” floral arrangement featuring pink roses, hot pink tulips, pink mini carnations, and pink gerbera daisies. These colorful flowers, which are accented with white Monte Casino asters and lush greens, are hand-arranged in a glass cube vase with a decorative pink satin ribbon, and available for same-day delivery. All of our bouquets can be delivered same-day to their home, office, or school. Be sure to check out the rest of our Teacher Appreciation Gift Ideas to find the perfect floral arrangement to express your sincere appreciation to him or her.